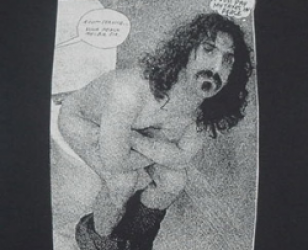 Short sleeved tee with distressed photo of naked Frank Zappa on a toilet seattaking a dump. Pants pulled down to the feet with his arms crossed on his lapsin a rebelling position. Conversational texts included allover.